Humans are a visual species. Our brains process visual information 60,000 times faster than text, and retain 60% more of what we see than what we read. So, it makes sense that mastering the art of being visual can make your content more engaging, more memorable and more shareable. 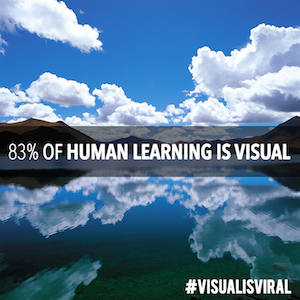 As we say at SlideShare, visual is viral. But while the majority of us identify as visual learners, we can’t all be expert photographers, illustrators, and graphic designers. Fortunately, there are plenty of tools and tips to help you create more enticing graphics for your content. Here are three SlideShares to help you effectively show -- not tell -- your message. This deck taps into the minds of visual virtuosos, and reveals the tools they have up their sleeves. From removing objects from pictures without Photoshop to adding artsy text to images in a snap, this deck can help bring your visual content up to par with the professionals. No graphic design degree necessary. It's no secret that visual content gets shared more on social media. In this (very visual) deck, social media experts share their advice for engaging audiences on social media with imagery. Public speaking might be America’s #1 phobia, but with the right visual aids, you can boost the confidence and engagement you need for a successful presentation. This deck provides shortcuts to improve your presentation, including how to structure your slides and where to find fonts that are anything but Times New Roman.